Well where is it? What happened to that sick Tahoe winter? Everyone kept saying “Oh it will come, don’t worry, it will snow.” Even that Spoke Junkie dude in November said, “Just wait, once it starts you will never forget it!” Right, we won’t forget this winter. Oh, I know, Miracle March three hundred inches, and then Marvelous May. Yeah right. I’m not going to say it’s over or anything like that, but as I write this, it sure feels like spring out there. 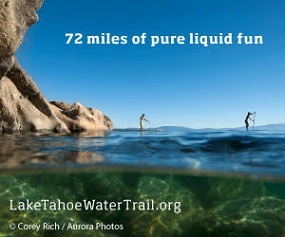 This article was published in South Shore’s only newspaper worth reading, Tahoe Mountain News in the March 2012 issue. We have officially just hit a point in our snowpack that puts us above the ’76-’77 snow pack, barely, yahoo. But that last storm series also sent everyone runnin’ for the hills, to get a taste of what we have all been so starved for, sweet pow. For most the result was rewarding, that probably was the best skiing/riding so far this anemic season, but with so slim a base and such bad layers in the snow, the result was not so sweet for all. 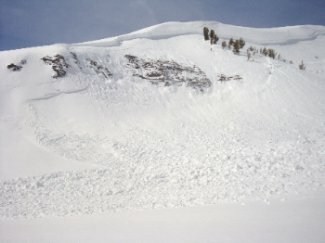 Everything from damaged equipment to “broke off bodies” to the two very sad avalanche fatalities here in the Tahoe area, and all from one little storm series. And I can’t believe how many people coming into the shop have asked how could there be avalanche burials with so little snow on the ground. There are probably a thousand answers to that question. The first one is that we were all waiting for “that” storm, so when it hit we all kind of forgot what was underneath the fresh stuff and jumped on it. The storms dumped anywhere from two to four feet of snow, so first of all, that is enough snow to create dangerous avalanche hazards. But then several other elements added together to make it especially dangerous. Very light cold snow had fallen on hard in some places icy snow. This meant there was a poor bond at the bottom of all the new snow. The storms were also very windy throughout the entire period. This means a huge amount of snow was blown over to the leeward side of peaks and ridges creating large areas of even deeper wind loaded snow. These are dangerous zones during and sometimes long periods after a storm, and they just happen to be where we tend to want to play because the best snow is usually there! This is exactly where these two accidents occurred with the crown (the point of origination of the avalanche) in the Carson Pass incident reaching five feet in depth. Then just to make things even more interesting we had a shallow snowpack on the ground that went through some pretty cold temperatures causing some faceting down in the snow layers. To make a long and technical story short, this means there were (are and will be) some weak layers down in the older snow caused by snow crystals that don’t bond to each other which will tend to break loose and create slides on many different aspects. I do understand how people are surprised by the difference between last year which was of course epic and huge with no local avalanche burials and this year with so little snowpack and already tragic results! Either way it is all a part of this passion we have for snow covered mountains. It is a beautiful, spiritual, exciting and dangerous place to spend time. We do know that any moment out there could be our last, but probably won’t. But then the same thing goes every time we climb into that metal box and drive down highway 50, that is way more frightening to me. All of this also brings up the subject of learning as much as we can about avalanche safety and carrying the proper avy safety gear. There are three levels of avalanche courses. Level one is a great class, always given out in the field and very good for raising awareness of the dangers, helping with the decision to travel through a zone or not and how to use beacon, probe and shovel. This is a class of basic knowledge that can save lives, plus it is pretty fun! The level two and three classes spend much more classroom time and are more concerned with snow science. These levels are of course great for anyone who spends time out there, but are really aimed at those who will be working in some capacity on the snow, guides, patrollers, even Caltrans workers who deal with avy work. One thing these classes always stress is the human factor. We can learn all sorts of information about the science of snow and avalanche prediction, control and avoidance, but when you are standing there at the top of some sick looking chute that you have worked hours to get to, you have seen some signs that say go home now while you are safe, but the ego says I just need to drop this line it will be just fine! We have all done it and been lucky. It is hard for those classes to protect us from ourselves. Another very useful tool for us is the Sierra Avalanche Center web site, updated every day it is full of great information that can keep us out of trouble. I do love the Sierra, I was writing this yesterday looking out the window at a beautiful bright warm spring day. I wake up this morning to finish and there is a fresh coat of snow on the ground and it is dumping! We have lost two more of our brothers who travel on the snow, our hearts and condolences go out to their friends and families. Gary Bell is the owner of Sierra Ski and Cycle Works, a South Shore institution that rents and sells skis and ski gear and mountain bikes and mtb gear for over 31 years. The little shop with the big fun is located at 3430 Lake Tahoe Blvd., next to Safeway, open daily from 8am to 6pm. Need the inside scoop? Call Gary, Chris or Troy for mountain conditions at (530) 541-7505.